It is August the 13th 1970. The policeman, Evald Hansen Maarup, had been on highway patrol and had just droped of his colleague in the toen of Haderslev. It was closing time, and since Maarup should meet early the next morning, he drove home in the police car. "When I came to top of a hill, the engine halted, and the light on the police car went out. I started to slow down and pull over to the side. The same moment as I stopped, the car was suddenly illuminated. The became stronger and stronger - it was almost the light of a cutting burner." " ... And when I look up, along this strange light cone, it gives a shining light from the bottom of a large silver-gray object which is up in the air above me, at the height of a tree. The road on this spot is six meters wide, and this strange monstrosity, which were hanging in the air, have been more than double that, more than 15 meters in diameter." The light cone was strange, in the way, that it was sharply defined at the bottom so that we could see under it, as if it were a surface. It took about five seconds from the cone of light "released" the car, and then it disappeared into a hole or bright tube at the bottom of subject. The hole was about a meter in diameter. Maarup also noticed that two things lumped from the underside of the silver-gray surface. These dents were around one and a half meters in diameter. At some point under the observation it comes to Maarup mind that there a camera, mounted under the ceiling of the wind shield. He took three pictures. When the subject had disappeared vertically in the air - which only took a few seconds - the light on the police car came back on. Maarup tried to start the car, which succeeded. After confirming that there was now radio contact with the station, he took so three images more, and then got out to look around. He went around to see whether there would be traces or residues of something, but found nothing. At some point, Maarup put his hand on the white front wing. It was hot, like the police car had been in direct sunlight the whole day. As he stood there a car was passing by, but he did not dare to stop it. 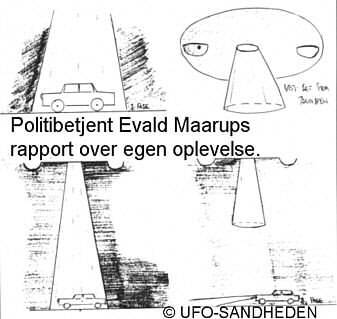 The policeman Maarup could see the oddness if he stopped a car on a deserted road to ask: "Excuse me, but have you seen a flying saucer or something like that ?". The policeman, Evald Maarup, had wondered if it was a helicopter, but there had not been a sound to hear throughout the observation. The area, where the incident took place, was completely open. There was neither trees or electrical wiring within a radius of 500 meters, and nothing, that might could have caused light phenomenon. He continued home and saw, the light from a jet aircraft as he was pulling up to his house. Nothing else happened that evening. The next day Maarup delivered the film to developing, and it was ready later on the afternoon. He then phoned the airforce base 'Skydstrup' to hear, on his report would be of interest. It did - an officer came to get the film, which Maarup had taken. A journalist (Bent Zachariassen) had been intercept what had happened, and had set a number of things to work, including contacting Denmark's Radio television TV topical. He then told the entire experience again to television topical, airforce base Skydstrup, then phoned him to hear whether he had contacted television topical, and if he had released the pictures to television topical. 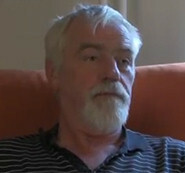 Maarup denied that but said that the television could have the pictures, when they were done with them. he case was going up at the top of Danish's hierarchy. Danish Radio contacted the Danish Air Force, but here the anserw was not to release the pictures. The policeman, Evald Maarup (photo to left): "If I wasn´t a policeman, and not driving in uniform, no one would have believed me. It is not me they believe in, it´s, the car and the uniform. If I were driven in my small NSU Prinz (a small car), then I probably would have have kept quiet." "Yes, ofcourse I have. It´s hard not to. You can make the assumption, that it is an object which is remote controlled from one or other place, it is hard to say. But when it is comming and just follows this car, until it is stationary, and then keeps standing above it, there must be a intelligent being os some sort, controlling it. It can not be done from Venus or Mars." "The light came over the road, where I was about to slow down the police car. The instant, the car stood still, it was ensnared in the cone of light, and all my systems "died", the engine stalled, and the light on the car went out. The cone of light came form from the north, where the subject had an 45 degress and held this position in front of the car, and then tilted 45 degrees to the opposite side". With the automatic camera Maarup took four pictures. These however shows only a spot of light, and Maarup tells: "When the subject tiltede so that the light came on a slant of the car, it was clear to see the perimeter and the bottom of a large object of more than 15 meters in diameter, three large balls sticking out from the bottom". The Object moved again, and the cone of light swept into a field south of the road. As for Maarups first observation happened that light was drawn up in the vessel. This time Maarup also saw details such as a the shape of the structure with square windows, which had soft rounded in corners. All windows was lighted, and with a rush of the gust of wind the subject disappeared with great speed. Light from subject were strong and blue-white in color, and it was warm as the sunlight. Maarup was this time out of the car, during the observation of the unknown object, and the observation lasted for five minutes. 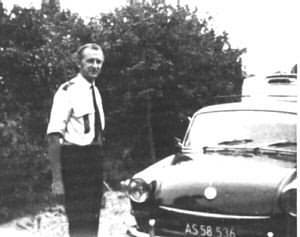 "In 1969, I came in to the Royal Danish air force. I worked on the radar station for 6 years. During the period, there have appeared several objects on the radar, which could be confirmed to be solid objects ,but who behaved like a "not known" object. 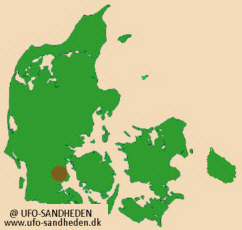 I remember best the morning, where the police officer Evald Maarup from Haderslev was stopped by a UFO. That night I was on duty, and we had an object on the radar screen, which was a real solid object. A known aircraft flying with a maximum speed, and above or below a certain speed, it cannot fly – nor can it suddenly fly very fast in one direction, and in the course of the 12-second flying in a different direction at the same speed. These are things we have seen on radar, unknown solid flying objects. Observations which I have just described, would not talk about, but remain a secret".